Studio, by Monitor Audio, is a one-off design by the company, one of the last to spring from the pen (well, the pen on the tablet of the CAD/CAM computer) of Dean Hartley, who stood down as technical grand fromage of the company earlier this year. The Studio is not intended to be a part of a range, nor is it intended to replace any of the company’s Bronze, Silver, Gold, or Platinum models; it’s a purely standalone project, although one that has more than a little bit of flagship PL500-II loudspeaker in its DNA. The name ‘Studio’ itself harks back to a long-discontinued top of the Monitor Audio tree, although about the only things this loudspeaker has in common with that old range-topper is the name and the use of metal as a diaphragm material in all its drive units. The Studio, 2018-style is a far more down-to-earth model, set in a classic D’Appolito or MTM (mid-treble-mid) design, in line with the central section of the present PL500-II flagship. 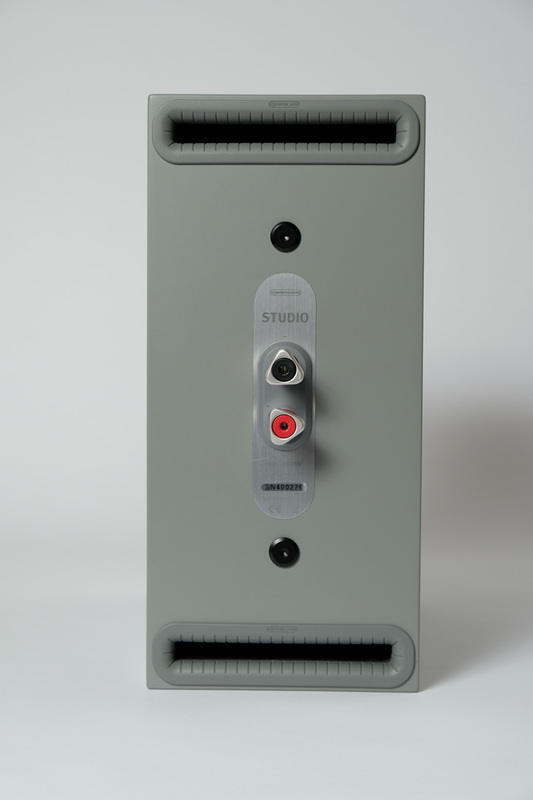 Of course, that is a cost-no-object, heavyweight multi-driver tower design, and the Studio is a slimline stand-mount that gets you change from a grand. Most importantly, what it takes from the PL500-II (and, in fact, all of the Platinum range) is what it calls an MPD or Micro Pleated Diaphragm high-frequency transducer (tweeter). This tweeter uses a pleated aluminium film diaphragm bonded to Kapton. This aluminium is then etched away leaving a resistive trace (akin to those on a PCB), which effectively acts as a voice coil. This diaphragm is then held in place by steel plates, and when an electrical signal passes through the traces, the resultant force makes the diaphragm’s pleats squeeze laterally in a manner akin to an accordion (only much, much smaller). By now, keen-eyed audio enthusiasts will be jumping up and down saying ‘It’s an AMT!’, but they are only part right; the MPD variant made by Monitor Audio uses larger rolls than typical Air Motion Transformer designs, to eliminate frequency nulls up in the 30kHz-40kHz region, and phase shift issues in the audio band. Monitor Audio gives credit to Oskar Heil for the original AMT design but thinks its MPD variant improves upon the original. Coupled with that Platinum Series driver are a pair of 100mm RDT II mid-bass units, bolted to the rear panel. These are also taken directly from the centre of the flagship PL500-II. First seen in 2016, this hybrid diaphragm features a C-CAM aluminium/magnesium cone front skin bonded to a central core of Nomex, finally with a rear skin of carbon fibre. This sandwich construction is – according to Monitor Audio – ‘just like a perfect piston’ in that it is very light, yet very rigid and very strong. Monitor Audio has been developing hybrid cones for many years, and this is perhaps the company’s lowest distortion model to date. Even the cabinet has elements of the PL500-II central section in its design, with its curved, elongated figure-of-eight front baffle section, although this is a far cry from the more complex raised and scooped shape of the flagship’s centre section. The cabinet itself is a relatively standard, if tall, rectangular box, albeit finished in satin black, white, or grey to give it that studio appeal. It also features twin HiVe II flow-tuned ports, top and bottom, to give the symmetrical layout of the loudspeakers an equally symmetrical port output. In between these two letterbox ports is a single set of beefy, custom-made rhodium plated terminals, designed to accept spades, 4mm plugs, and bare wires. A matching pair of stands are available and – because the Studio’s footprint is relatively narrow compared to most stands – are recommended. Even at £350.